19th century George IV period mahogany antique extending breakfast dining table standing on central four splay base. 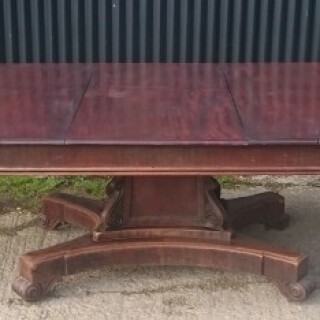 This is an extremely strong and versatile dining table which can be adjusted to seat from four up to a comfortable twelve (or fourteen with either two at each end or one at each end without side plates). The leaves can be stored inside the table itself which is extremely rare for a table of this period and is quite an achievement when the sheer size and weight of the leaves is taken into consideration. The timber used for this table is second to none, it is a dense grained, slow growing mahogany with excellent grain pattern and beautiful parallel lines. The leaves are original thank goodness, as this size of leaf is very hard to find and extremely expensive to replace nowadays. The discrepancy between the colour of the leaves and the table ends will no longer be evident following restoration, so please do not worry about that. This table represents a remarkable feat of engineering, as it has to be designed specifically to take the weight of the leaves which are unsupported at the ends, but also has to be manufactured to a very high tolerance in order to eradicate the natural movement in the mechanism which a legged table would be able to get away with. I could go on, but in conclusion would like to say that this is a really special table, wonderful timber, a fantastic design and it is really impressive both visually and from a constructional standpoint.